Besides seasoning your food well, one of the best ways to apply flavor is to marinate. The great thing is you can marinate vegetables, fishes, meats, heck, even some fruits. Yes, you can marinate fruits & vegetables — but we will cover both later down the road. Depending on the marinade and how much flavor you either want or have time to achieve, a marinade can flavor meat or other items in as little as 30 minutes or up to 24 hours. Since it’s almost summer and for most that is the main grilling season, we will now turn our attention to the humble grilled chicken. One of the biggest problems with chicken is that it can be really bland. Plus, if you season the outside too much and apply too much heat to the chicken you may burn the outside, leaving raw chicken, or it could intensify the seasoning you used — making it too spicy, too salty or too sweet to enjoy. This is where marinating comes in. You can get some of those same flavors to penetrate deep into flesh of the meat simply by placing it in the marinade for a little while. What sort of things can you use in a marinade? Truthfully, the options are endless for what you can use. Let me give you a few examples. Don’t use this list as a recipe mind you, but just pick some items that sound good together. Rosemary — Just remove the leaves from the stem & place in your plastic bag or bowl for the marinade, lightly crushing the stem to release that essence of flavor from the herb, and toss that into the marinade as well. Salt and Pepper — Always use salt & pepper in a marinade, seasoning according to your tastes. Vinegar — A splash of regular balsamic, apple cider, and champagne vinegar can give some nice notes of acidity and sweetness to a marinade. Crushed Garlic — I recommend just peeling a few cloves, smashing so the flesh starts to open and the oils will release, before tossing the cloves into the marinade. Use as many cloves as suits your tastes or the flavor you’re looking to achieve. Oil — Some types of cooking oils will work well for any marinade, such as olive, canola or grape seed oil. Spices — Anything will work, but I like paprika, garlic powder, onion powder, dried herbs and various spice mixtures depending on the type of meat you may be marinating. Citrus — Note: When applying citrus, make sure you use enough to get a little flavor and only marinate for a short period, making sure not to leave your fish in the marinade too long as too much citrus can cook your fish — hello ceviche! We aren’t covering that in this post, but instead we’ll leave that one for another day. I always recommend finishing fish with some kind of citrus for maximum flavor, or if you feel your fish is under-seasoned. Alright, now that we have covered the basics, lets talk application. Just throw everything in a bag and swish around until the seasonings dissolve in the liquid. If you don’t get it all don’t worry, you will get your chance to combine it all. Throw your protein in the bag with the marinade, seal it, set on a plate, and turn every 15 minutes for a 30-minute marinade or every couple of hours for a lengthier soak, which makes sure every part of the chicken gets covered. Oh, we are using skin on, bone-in chicken breasts, but you can use any of your favorite chicken pieces as well. You can cook these with any application really, but I suggest the grill or oven. This allows you to make sure you can secure a proper, elegant cook and will help keep the meat moist. Make sure you check the cooking times for the type of chicken you have selected, as these can vary. For us, a bone-in, skin-on chicken breast will take about 30 minutes on the grill or in our oven. Remember to pull your chicken off of the heat a little bit early to let it finish cooking without drying out. 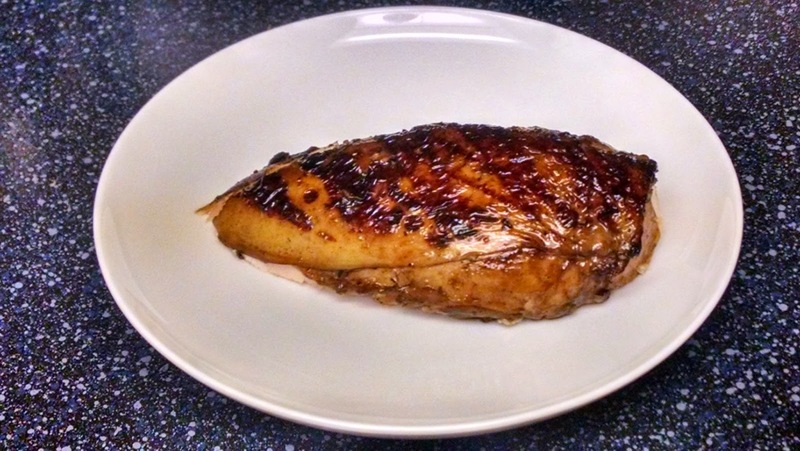 Properly cooked chicken after resting should have an internal temperature of 165 degrees. I usually pull our chicken off the grill or out of the oven at about 155 – 160 degrees as it will finish during the rest period. Feel free to use a digital thermometer to check the internal temperature, or after it has rested go ahead and cut into the chicken and make sure you don’t see any pink and that the juices run clear. 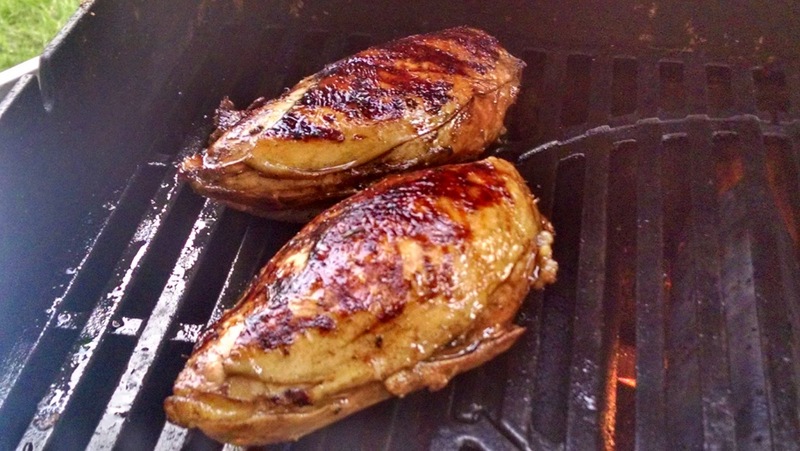 After about 5-7 minutes on the grill your chicken should start to look like this. You can also serve the breast off the bone if you prefer, which makes for a really nice presentation. 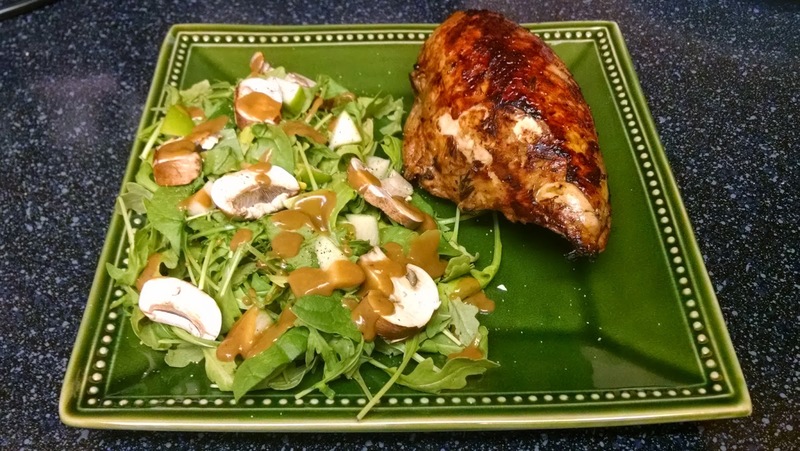 Chicken finished with a nice salad of arugula, green apples, spinach, mushrooms, and homemade balsamic of course.